Home // Discipleship Process // What’s Your Next Step? One of the great themes of this life the Lord has given us is that of progress. Consider the stages of growth. We begin as a dependent infant and move through various phases of physical, mental, and emotional development. Consider our salvation. Repenting and believing in Christ is a spark of spiritual growth, not a fizzling-out flame that leaves us in our sinful patterns. Consider our relationships. Long-term commitment where you make concerted and often difficult efforts to know a person more deeply always produces greater relational fruit. Small steps can lead to exponential progress. Progress is also the way of our everyday lives. You have to step out of the door to get to your car. You have to decide to eat healthier and exercise more to make fitness gains. You have to start the conversation to get the date. You have to work harder to get the promotion. You have to take steps, often uncomfortable ones, to make any advancements in virtually every area of life. Deciding to worship more frequently? Finally joining a class or group? Stepping up to use a gift and serve? Attending Sunday’s Membership Class and joining? Inviting that person you have been praying for to come with you on a Sunday morning? Attending Sunday’s Missions Orientation and putting a trip on your calendar? 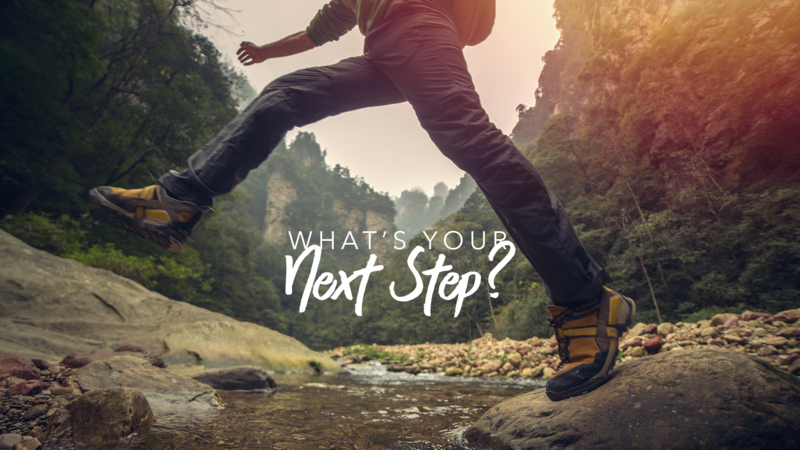 I pray you’ll take some next steps. Let’s have the spirit of Job when he acknowledged accountability for his priorities and time saying, “I would give him an account of all my steps” (31:37, ESV). For God’s glory, and for the good of others, take the next step!